The holiday season traditionally is a time of indulgence as party season revs up. Healthy diets typically fly right out the window when faced with a dizzying array of fatty meats, gooey dips, greasy chips and tempting sweets. When it comes to party fare, too often empty calories and excess fat are the order of the day. But that doesn’t mean you can’t have your cake and eat it, too. Holiday parties are opportunities to be social, and, surprise, also eat healthfully. Which foods at the soiree will keep your training diet on track and which will set you back? Follow these party eating survival strategies to assure that you don’t emerge from the holiday season with a few too many pounds to run off. Those platters of sliced vegetables are a great place to load up on vitamins, antioxidants and fibre. They are crunchy and filling, making it easier to avoid all of the temptation screaming at you from the dessert table. 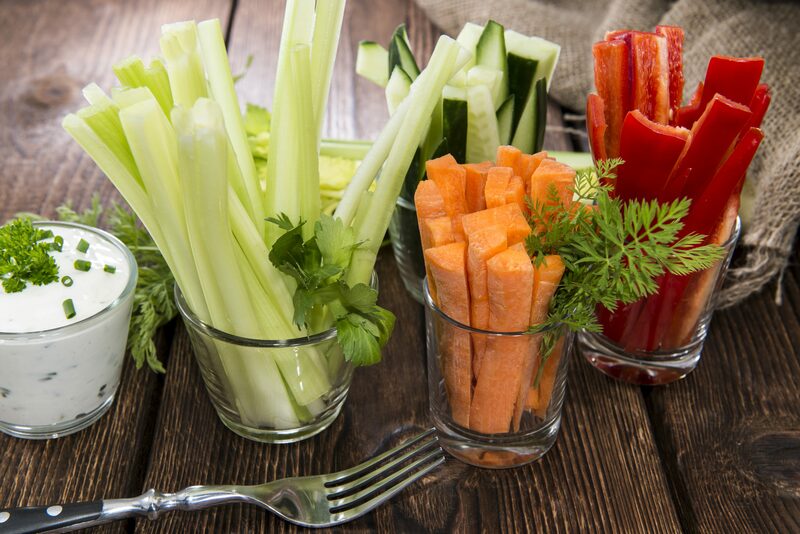 Aim to fill half your plate with luminous vegetables like carrots, broccoli florets and celery sticks. Most veggie trays are accompanied by creamy dips containing an avalanche of calories. Hummus is always a winner due to the extra fibre and protein from chickpeas, not to mention it’s typically lower in calories than creamy dips. Made with nutrient-rich avocado, guacamole can also be less hazardous for double-dipping. Similarly, salsa is one of the healthier toppings available as it’s mostly composed of vegetables and low in calories. The tempting cheese platter need not be off limits. Cheese provides hunger-quelling protein and calcium to help build bones of steel. Most cheeses, especially hard ones, are fairly high in calories, so to try and cap your portion at a couple of ounces. Soft cheeses such goat and brie cheese are among the lowest calorie options since they contain more moisture. If left out of the cold for too long, those cheese balls can harbor dangerous levels of bacteria thereby raising the risk for food poisoning. Besides, they often contain a monster amount of calories. Chances are, whichever celebration you’re attending, there’ll be an array of alluring desserts. Reaching for melons, strawberries and other fresh fruit can be a way to help tame an aching sweet tooth. As with veggies, fruit is nutrient-dense and slim on calories. Be very leery of those chocolate dips and caramel sauces that hover around the fruit platter. They tend to be more sugary calories than anything. If you want to jazz up raw fruit, try squirts of lime or lemon juice. With more people trying to offer healthy choices at festive gatherings, it’s becoming easier to find options like whole grain crackers when you want something crunchy. Use them as a delivery system for healthier dips. A constant at any party, chips and pretzels are mostly empty carbohydrate calories, making it easy to plough through a bowl before you know it. Not an ideal way to carb load. When you do reach for chips, opt for those that are baked instead of fried. Shrimp is very lean, so those rings of the shellfish are almost always a low calorie seafood choice. A three ounce serving of shrimp weighs in at only 90 calories. Also look out for smoked salmon which an excellent source of heart-healthy omega-3 fats. To reduce food contamination risk, make sure the shrimp is on ice so it’s nice and cold. Run away from any fish that’s been mixed with items like mayonnaise or sour cream which can significantly hike up the calories. Also proceed with caution when it comes to any swimmers that have been doused in batter. Skewers of chicken are one of the better hors d’oeuvres meat options at a party. The protein from the poultry can help fill you up making it less likely you’ll stuff yourself silly. Fat-laden skin and questionable sauces should make you chicken to nibble on too many chicken wings. Also, meatballs are often made with fatty cuts of beef plus some extras like eggs that make them little calorie bombs. You might be prone to shying away from the bowls of nuts since they are high in fat, but their fat is generally considered to be healthy. Cashews, almonds and the like are loaded with beneficial nutrients for athletes. So rather than mindlessly munching on greasy chips, grab a handful of nuts – they’ll also keep you satisfied longer. Steer clear of nuts with add-ons like chocolate coating or ones that are doused in generous amounts of salt which can drive up your thirst for sugary party drinks. Virgin Bloody Mary’s can help you effortlessly get one or more servings of veggies. Another party drink option is to cut 100% fruit juices like pomegranate or grape with sparkling water to reduce sugar calorie intake. Any of the sweet drinks like daquiris, margaritas, and pina coladas are often very high in sugar, which lead to unwanted holiday weight gain and sagging energy levels if imbibed with reckless abandon. If you’re eyeing the cake platter, opt for angle food cake. This light and fluffy guise of cake is much lower in fat and calories than rich and dense options like cheesecake or pecan pie. Go ahead and top your slice with fruit such as raspberries or creamy Greek yogurt. Bite-sized cookies and brownies may seem harmless, but a few too many can easily set you back hundreds of calories. The concern with these items is that their small size makes you feel less guilty when eating them compared to a large slice of pie or cake. It’s all about smaller overall portions when it comes to desserts. Here’s a fresh take on the ubiquitous party dip that is excellent with crackers, baked tortilla chips or crudités. In a medium sized saucepan, bring lentils, bay leaf and 2 1/2 cups of water to a boil. Reduce heat to medium-low and simmer covered until the lentils are very tender, about 30 minutes. Drain lentils, discard bay leaf and set aside to cool. Place cooled lentils in a food processor container along with remaining ingredients and blend until smooth. These gems are sure to disappear from the dessert table quickly. Almond butter delivers impressive amounts of healthy fats, while dark chocolate is a great source of age-avenging antioxidants. In a bowl, mix together almond butter, sugar and vanilla. Roll into 20 equal sized balls. Place on a baking sheet lined with wax or parchment paper and freeze until firm, about one hour. To melt the chocolate, stir it in metal or glass bowl set over a saucepan of lightly simmering water until smooth. Or place chocolate in a microwave safe bowl and microwave in 25 second intervals until melted, stiring between each interval. Roll the almond balls in melted chocolate, garnishing with a few grains of salt as you go. Refrigerate until the chocolate is set, about 30 minutes.